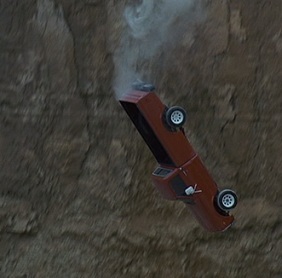 You’re probably thinking, “What on earth does Cars have to do with Groundhog Day? You’ve gone too far this time with your movie comparisons. How dare you!” Or something like that. I can understand your skepticism, but I think by the end of this article you’ll see these two films from a new perspective, and you’ll agree that not only do they have the same message, but also just about the same story. Pixar practically remade Bill Murray’s classic comedy. So let’s get started! The message of both films is exactly the same: Stop being so self-centered, and think of others instead of yourself. 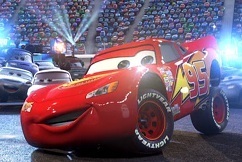 In Cars, a rookie racecar called Lightning McQueen gets sidetracked on his way to a big championship race, and he faces day after day of drudgery in a small town called Radiator Springs. But he learns to care about the people in the town and puts their needs above his own. 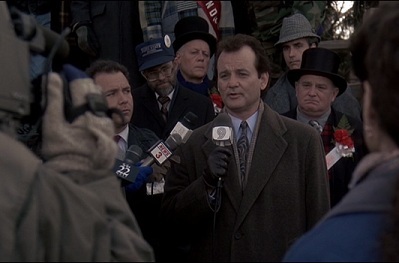 In Groundhog Day, a hopelessly rude weatherman named Phil Connors keeps repeating the same day in Punxsutawney, Pennsylvania. He stays there for a very long time until he finally learns to stop caring only about himself and start devoting the entire day to helping other people. Now let’s talk about all the little details. Lightning is excited to leave his sponsor Rust-Eze and move on to a much bigger one – Dinoco. 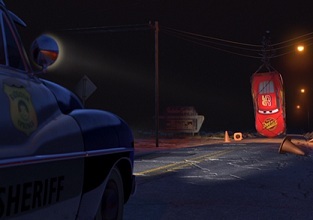 However, he gets lost one night in Radiator Springs and gets his gas siphoned so even if he tries to escape, he just runs out of gas. Because of his fast-paced life, Lightning has trouble adjusting to the boring town and the easy-going people who populate it. He’s used to making fun of people and getting his way all the time. But his arrogance turns from an asset into a liability. Phil is happy because he’s leaving his local TV news station for a much larger network, so he won’t have to cover the Groundhog Day festivities again after this time. He’s not as young as Lightning, but he’s just as ambitious and rude to everyone. However, a blizzard blocks the roads and traps him in Punxsutawney an extra night. Little does he know that the blizzard will be the least of his problems when he wakes up the next morning. 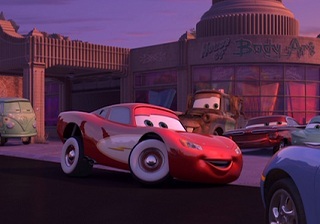 Lightning is forced to repave the Radiator Springs’ main street after he accidentally tears it up. Unfortunately, he’s in such a hurry to get out of town that he does a terrible job at paving the road on his first day that he has to tear it up and start over. This means he has to basically relive the same day the next day but do a better job this time. Phil literally relives the same day every time he wakes up. At 6 a.m. everything resets to how it was 24 hours ago, and he has to relive the worst day of his life again and again. But he is the only one who remembers what happened the day before. This is pure torture for him at first, but he learns to take advantage of the situation to steal thousands of dollars and learn all sorts of new skills. When Lightning gets to town, he learns that his antics, which work so well on teenage girls, don’t charm a sophisticated career woman (or Porche, I guess) named Sally. She sees right through him and mocks his bad attitude at every turn. Only when he stops being rude and lightens up does she begin to be nice to him and trust him bit by bit. Phil is accompanied to Punxsutawney by a sweet producer named Rita. When he first sees her, he is instantly smitten but quickly covers his feelings under a shroud of insults. She’s the only one he really confides in. Even though she can’t remember what happened the day before, Rita always sees through Phil’s pranks, and she seems to be the only woman in town who he can’t manipulate into loving him. He has to earn her love by becoming a better man. 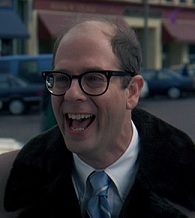 Two characters stand out above all the rest as the most annoying in these movies: Mater and Ned Ryerson. But only one of them gets a proper comeuppance while we’re actually expected to like the other one. 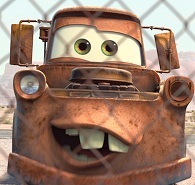 Let’s start with Mater. He is supposed to be a lovable Disney character who steals the show. Instead, he comes across as a bit annoying and a little manipulative. After Lightning spends a little time bonding with Mater, Sally points out that Mater likes him, and she doesn’t want to see Mater get hurt. The way she talks about him makes him sound almost like he’s mentally handicapped rather than just a simpleton. That’s always kind of turned me off from the character because it’s like the film is trying to get me to laugh at a retarded person. Ned is a whole other story. He throws himself at Phil every day, rudely interrupting him on his way to Gobbler’s Nob to do his job. He even laughs at Phil’s misfortune of sticking his foot into a puddle of freezing water. It’s such a pleasure to see Phil eventually stop putting up with Ned’s annoyance and give him a punch in the face. However, that’s not enough for this movie. Phil also kills him with kindness. He finds a way to make Ned feel uncomfortable and run away in fear. And at the end, Phil and Rita snub Ned in the nicest way possible. 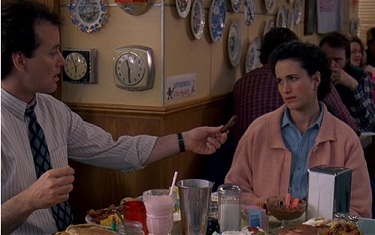 Only in Groundhog Day can you have your cake and eat it, too. We can enjoy the (admittedly base) satisfaction of seeing the annoying character get knocked senseless and then get even more pleasure out of seeing him beaten in much more subtle and creative ways. 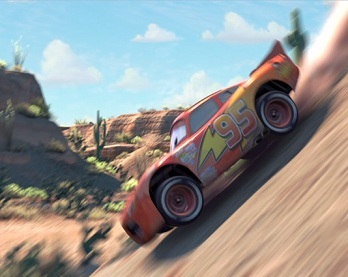 An old racecar named Doc Hudson, after overcoming his prejudice against a fellow hotshot, eventually takes Lightning under his wing and teaches him a special move to correct himself when he’s going the wrong way in the dirt. He tells Lightning to move his tires right to go left. Unfortunately, it takes a little while for Lightning to get the hang of that move. The first time he tries he winds up falling off a cliff into a field of cacti. After a long time of playing around and taking advantage of everyone in town, Phil eventually becomes depressed and turns to suicide as the answer to his problems. However, even that doesn’t work because he just wakes up again the following morning alive and well. He walks in front of a truck, electrocutes himself in a bathtub and even jumps off a cliff in slow motion while ethereal music plays. The heart of these two movies occurs at different times. 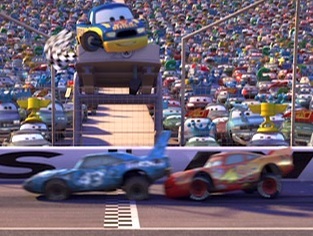 In Cars, it comes after Lightning leaves town and makes it to the championship race. He is about to win the race when suddenly the current champ (he’s just known as the King) gets badly hurt by another car. Rather than finish the race in first place, Lightning goes back and pushes the King across the finish line, demonstrating self-sacrifice. He realizes that winning isn’t everything. He’s content to give up his dream of being Dinoco’s racecar and just be known as a nice guy. Groundhog Day’s heart comes a little earlier. Day after day, Phil passes by an old homeless man without paying much attention to him. But one night he sees the old man struggling for breath, and he has compassion for him. Phil is shocked to learn that no matter what he does, even if he devotes the whole day to helping this man, the man dies. There’s nothing he can do. This is the key turning point in Phil’s life. Up to this point he’s been focused on himself because that’s all he cares about. He has used people, stolen from a bank, and done things to better his situation. He has even started to believe he’s God because he can’t die, and he knows everything about everyone and can predict the future with perfect accuracy. But in this instance, he’s powerless. He realizes he can’t fight death, and all he can do is accept it as part of life and try to make people as comfortable as possible when they are facing it. With this in mind, he sets out to do something he’s never done before: spend a whole day helping others. Before Lightning leaves town, he finishes paving the road and then fulfills everyone’s dream by being their customer for a day. Radiator Springs has been cut off from the outside world for decades, so they’ve been desperate to serve even just one customer. Lightning gladly buys products and services from every shop in town and reinvigorates the city by making it look as beautiful as it did in its heyday. All of this makes Sally begin to fall in love with him. Phil spends what’s probably decades getting to know every person and event in Punxsutawney. Because of all of the knowledge he accumulates, he’s able to give a perfect news report in the morning and then go around saving people’s lives, fixing flat tires and making everyone else’s dreams come true. He doesn’t think of himself the whole day. And by doing all of that he proves he’s a new man and he finally wins Rita’s heart. 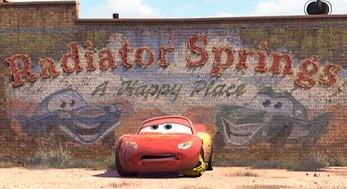 After his big race, Lightning returns to Radiator Springs and makes it his new headquarters. He brings with him a slew of media attention and new customers for all the shops in town. Lightning is then free to literally pursue Sally and start a relationship with her. Everyone gets a happy ending. 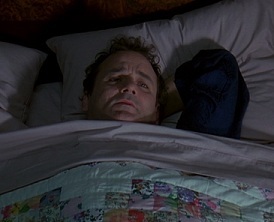 Phil is amazed when he wakes up the morning after his perfect day to discover it’s not Groundhog Day anymore. Somehow, his change of heart broke the spell and he’s now free to live a happy life with his new love, Rita. Perhaps this is how everything was supposed to turn out, so some cosmic power was waiting for Phil to make everything just right to let time continue going forward. Whatever the case is, Phil is now content to live happily ever after in Punxsutawney, the town he knows better than anyone. There you have it. These two films have a lot more in common than you might think. They both have a clear message that people need to be nice to each other and learn to slow down a little and stop being so focused on themselves and their careers. 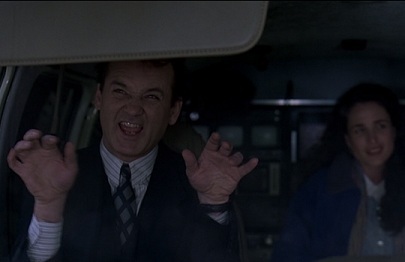 Of course, Groundhog Day is a much better movie than Cars. 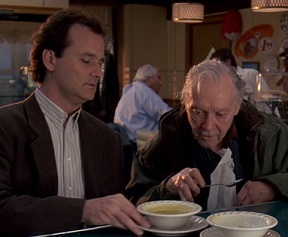 It’s more subtle about its message, and Bill Murray gives one of the best performances of his life while Owen Wilson (Lightning) just acts like every other character he’s ever played. Just a side note: I’ve always wondered what Phil did on the morning of February 4th. He probably went to a completely different hotel to sleep just so things would be as different as possible when he woke up. And he probably slept in, too. If anything was similar at all to the previous morning he would probably have a nervous breakdown. 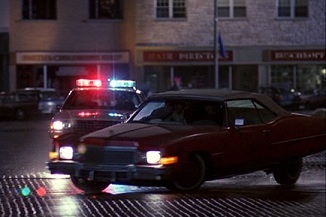 All photos from Cars and Groundhog Day are the copyright of Walt Disney Pictures and Columbia Pictures, respectively. 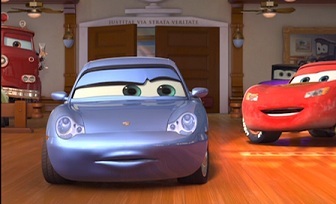 This entry was posted in Message Movie Battle and tagged animated films, bill murray, cars, comedy, death, films, fun, groundhog day, lightning mcqueen, message movies, movie review, movies, pixar, punxsutawney, race, relationships, romance. Bookmark the permalink.